PORTER, TX -- A report of a suspicious person at a Walmart resulted in a string of charges for one man. Around 7:15pm Sunday, a Pct. 4 Deputy Constable and two Montgomery County Sheriff's deputies were called to the Walmart located at 23561 US 59 in Porter. Montgomery County dispatch warned deputies a white male wearing a camouflage jacket was seen donning body armor and circling his SUV, which he also moved several times. 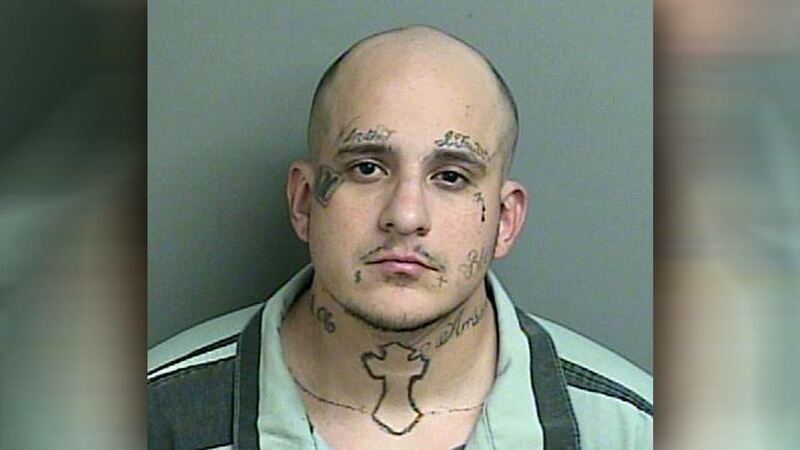 When the Precinct 4 deputy arrived, he spotted the suspect and began driving towards him. That's when the man opened his car door and began to reach into the vehicle. The MCSO deputies were also approaching and all three officers drew their weapons. The Precinct 4 deputy told the suspect to place his hands on his face and walk backwards to him. The deputy then patted down the suspect, Christopher Longoria, 27, and reportedly found a pistol in his front right pocket. Authorities say he also removed a hard sunglasses case that was hanging on a lanyard that Longoria was wearing around his neck, and a pill bottle containing Hydrocodone from his shirt pocket. The sunglasses case reportedly contained a small digital scale and multiple small clear and colored zip locking plastic bags containing methamphetamine. According to authorities, inside his vehicle, Longoria also had multiple boxes of ammunition, a mask, rifle bipods (used to steady when shooting), loose ammunition and more small plastic bags with methamphetamine residue inside. When asked about a blood stain on his camouflage jacket, Longoria said it was his own blood and that he'd been shot two days earlier. Medics were called to the scene and confirmed he had a gunshot wound. Longoria was transported to the emergency room at Kingwood Hospital, where he was treated and released. Longoria told deputies the narcotics in his possession were to keep him awake and make sure no one would harm him. He claimed he was shot at a gas station in Harris County and didn't know the shooter or his motivation. The evidence recovered included nine Hydrocodone, 52 empty blue small clear plastic bags, 92- 25mm ammunition (including six in the magazine in the pistol), a black digital scale, a green lanyard with sunglasses case, 16 green small clear plastic bags containing 65.3 grams of methamphetamine, a black body armor plate carrier with no plates, a 25 automatic chrome pistol with full magazine, two LG smart phones and .40 ammunition. Longoria, of Houston, is charged with first-degree felony manufacture / delivery of a controlled substance (penalty group 1) more than 4 grams but less than 200 grams; third-degree felony possession of a controlled substance (penalty group 3) more than 28 grams, but less than 200 grams; and third-degree felony unlawful possession of a firearm by felon. He has two prior felony convictions.